It was my first time back to Puerto Vallarta since I was there four years ago on behalf of my mom to sell her dream-house to a land speculator. Development forces beyond the control of law had built a big fancy marina right where we had once had our own perfect bit of beach. They ruined it all for us. Of course I had to go by to see what had become of our house. The new marina was in full flower with rich Gringos tying up yachts and heading out for mid-day cocktails. It was all part of the new “Riviera Nayarit.” I hated to admit it, but the Dark Side did well when they hit on that name. I was pleased to see that the house that I had poured my soul into designing and building in 1988 was still standing and actually looked better than ever from the street, with fresh paint and a new tile roof.I had a suspicion it wasn’t all that it seemed, so I approached the wrought iron fence on the side, looked both ways, and was over it with a quick hop. Around back, they had added a chain link fence that was being overtaken by wild bushes. Through the fence I could see the house was abandoned with doors hanging open. The lawn had turned to weeds and then to dead weeds. Our little trees were overgrown and sagging. The shaded back patio, where we had passed many an afternoon watching the wind rise on the ocean, was empty except for dead leaves and a stack of unused roof tiles. When I sold away the family property in 2010, I let the act of signing become the exact instant that I emotionally detached myself from it all. I would simply cease to care anymore about our dreams of an ocean-side family compound that would serve McKees for generations to come. Now, four years later, I stood looking through the back fence at the results of the intervening years and felt appropriately numb. 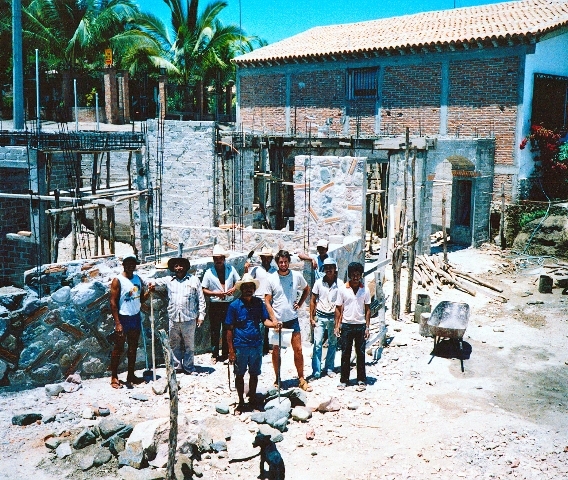 I had once dared to hope I might leave a lasting mark by the creation of a building made sturdy with stone and brick and concrete. I lifted myself back over the fence. Waiting by the car was my travel buddy John, former college roomy and general all-around bon vivant. I had just one thing to say about it all. Let’s go catch some waves. Within the hour, we were at the big beach at Destiladeras with boogie boards. The water was warm enough; the sets of waves medium high. After I saw John miss a couple of good waves, I showed him how to have a better ride by tilting the front part of the board down in front of the surging foam of the crashing wave to let it pull you along. Grab a hold of that energy and ride it, I said. Use your legs like a big rudder to steer. The next few waves ended with us up on the beach as the foam receded around us, with John managing to bump his board into mine and laughing like a goofball. Before the trip, we had separately gone online to check out potential adventures. It was possible to book all kinds of things in advance such as zip-lining, ATV rentals, parasailing, boat trips to Yelapa. But something about that rubbed us the wrong way. Our schedule would become rigid for things we hadn’t even seen. We decided to just work things out as they came. Good move, that. We became fond of switching hotels every night. It was fun to explore to find the next one. There were plenty to choose from. We tended to like the two and three story hotels a few blocks up from the beach. They were a fraction of the cost of the fancy hotels where tourists like us were expected to flock. (We paid $25 USD for double occupancy at the Hotel Ana Liz.) These hotel rooms didn’t have views. Some rooms had only obscure glass in windows that faced the inner courtyard. As long as the place was clean (they all were) and there were two mattresses and hot water in the morning and evening, we were good. Switching hotels was easy for us because we each had just one piece of luggage, easily thrown in the trunk or walked around the corner to the next hotel. Our vagabond ways allowed for an overnight Road Trip in our rental car to explore towns along the coast. 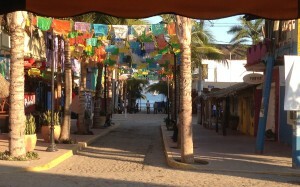 That’s how we found the surf town of Sayulita about forty minutes north of Puerto Vallarta. It was a great little village — just buzzing with restaurants, music and cool places to stay. As soon as we drove into town we knew we wanted to spend the night. Later, when we happened to walk by “Patricia’s Surf School” right there on the beach in the shade of some palm trees, we knew we wanted to take surfing lessons. Did we catch any waves? Oh yes indeed we caught some waves, though we didn’t exactly “shred” those waves. It was thrilling enough to stand and balance on top of all that moving energy, even if it was for just four or five seconds. When we got back to Vallarta after eleven the next night, we scored a hotel room and then enlisted the help of the night desk man there to direct us to good food nearby that would be open at that hour. We ended up having fantastic pozole soup just around the corner, in a simple little restaurant filled with locals out enjoying a late dinner. The restaurant was open to the street, the brick walls inside were painted with whitewash, and the ceiling consisted of corrugated roofing supported by a few wood beams. There were two fluorescent lights overhead, and there was a soccer game on a TV mounted on the end wall. In other words, it was thoroughly Mexican in every way, including the wonderful food we had there. A man out for dinner with his wife and young kids at the next table recommended we try the pozole soup. We found it to be chunky and tangy and a real treat. Pozole (pronounced poh-SO-leh) is now on my radar of good Mexican food to look for when I’m eating out. It was all great fun. But the moments that ended up resonating deeper in me were the low-key and unexpected ones, like the time we spent on the small sky-deck at our fourth hotel. This little concrete patio was quite comfortable for two. It was accessed by a spiral stair that would surely be ignored by the average hotel guest, which made it available for explorers like us to make it our own. This little patio looked over everything in that older part of Vallarta and was perfect for relaxing at night when the whole neighborhood got mellower and we were invisible in our aerie above it all. Red taillights could be seen from time to time headed up some steep street in the distance. A strip of blue neon highlighted the neighborhood church tower. Every now and then a bus would rumble by. It was like an exquisitely rendered diorama. The day after I returned home I was strangely listless. I spent that day moping in my office, returning calls and sorting through stacks of papers. Just one day removed from the trip and it all seemed impossibly distant. The week had started with a big reminder about the loss of the happy McKee life in Mexico, but there I was on the last day, floating out beyond the waves and realizing all over again just how beautiful are the pelicans in flight. Having fun in the ocean for a few days had somehow made everything all right. Never mind whether there’s a piece of paper that says you’re the owner. You’ve got to show up in order to have the moments. Getting out in the world is what it’s about. « The wind is rising. We must try to live.